Platform supply vessels battle the fire that was consuming remnants of the Deepwater Horizon oilrig in April 2010. This photo was taken by a U.S. Coast Guard MH-65C Dolphin rescue helicopter, which documented the fire while searching for survivors. 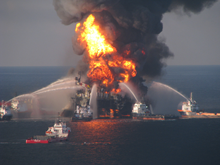 After years of investigations, it is becoming clear that prominent among causes of the disaster was the influence of organizational politics on the risk management processes at Transocean Ltd. (owner of the rig) and at BP. In an interview of Najmedin Meshkati, professor of civil, environmental and systems engineering at USC, reported by Neela Banerjee, and published in the Los Angeles Times on July 25, 2012, Meshkati says, "I heard from a reliable source that in the pursuit of profits, BP's longtime CEO, Lord John Browne, unofficially adopted Oscar Wilde's quote, 'consistency is the last refuge of the unimaginative,' as the company motto. And we all know well what inconsistency can do to system safety." Policies and procedures enforce consistency. Policies and procedures are the most effective means of controlling the influence of organizational politics on risk management. Photo courtesy United States Coast Guard. Read the final report on the incident, issued by the Bureau of Ocean Energy Management, Regulation and Enforcement, "REPORT REGARDING THE CAUSES OF THE APRIL 20, 2010 MACONDO WELL BLOWOUT." In Part I of this exploration of risks not directly related to task content, we focused on those risks that are associated with perceptions. Here are three additional risk classes that relate more closely to organizational politics. Internal errors are those that happen within the task, including, for example, premature disclosure of information, misstatements, and faulty estimates. External errors are those that happen within the hosting organization, such as server crashes, or terminations of key personnel. Contextual errors involve elements outside the hosting organization, such as vehicle collisions, fires, floods, or war. Relying on organizational processes for protection from all errors is risky. Understand the limits of the protections the organization provides. To the extent possible, provide your own coverage for remaining gaps. Although we usually associate securing resources with task initiation, maintaining access to resources is always important. And we're often surprised when we lose access to resources, even though most tasks experience resource interruptions at some point in their lives. Diligence and a strong personal network are vital in maintaining situational awareness with respect to resource predation. Create plans not only for adapting when resources are withdrawn, but also for defending the resources and commitments you already have. Organizations tend to continue doing whatever they've been doing, which in many cases, isn't much. One-of-a-kind or first-of-a-kind tasks are therefore likely to encounter difficulties, because of the inherent contrast between them and other work. to resource predationpronounced when the initiative originates somewhere other than the top of the organization. Advocates of such efforts can be effective when they have warm personal relationships with those who serve in gating functions that can impede progress. Political sabotage includes any effort to disrupt, delay, or terminate the task in order to free its resources for other efforts, or to besmirch the careers of the task's advocates. Tactics of political saboteurs can include spreading disinformation, reassigning key personnel, and manipulating resource streams. When political sabotage occurs, it's rarely a surprise. Plan for it. Include in statements of the task vision refutations of arguments saboteurs are likely to make someday. These arguments are far more effective when offered in advance of the sabotage attempts than they are when offered as defense after the fact. Would you like to see your comments posted here? rbrenSUUtSPXxwphGlEqXner@ChacLTEkKOomeUmUGrNwoCanyon.comSend me your comments by email, or by Web form. I offer email and telephone coaching at both corporate and individual rates. Contact Rick for details at rbrenEHSfLsqWJKXImmfDner@ChacopYfFQvbFkGwgycKoCanyon.com or (650) 787-6475, or toll-free in the continental US at (866) 378-5470.